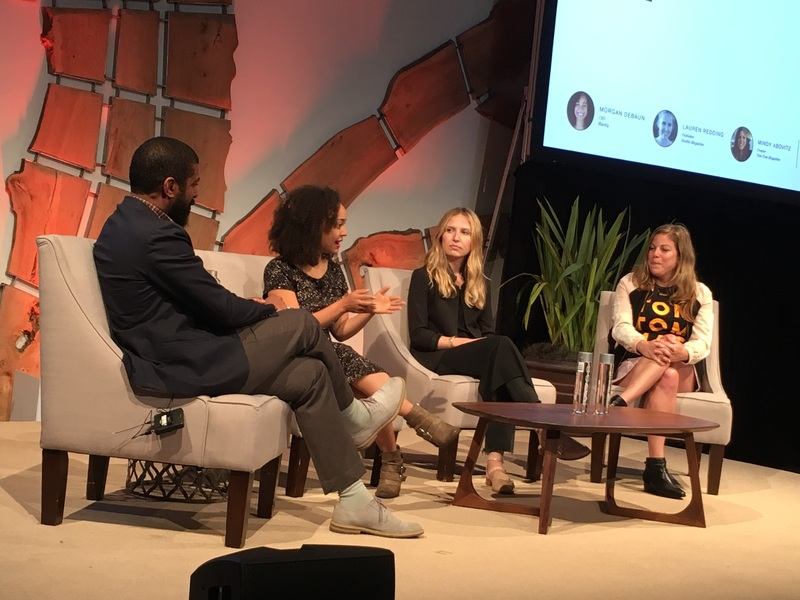 At the Issuu Generators Summit, George McCalman of McCalman.Co Studio, far left, interviews (from left) Morgan DeBaun of Blavity, Lauren Redding of Rookie Magazine and Mindy Abovitz of Tom Tom Magazine. SAN FRANCISCO – As the founder and editor-in-chief of Tom Tom Magazine, a feminist multi-platform media company dedicated to women drummers, Mindy Abovitz has faced more than her share of slammed doors and belittling comments. But the Brooklyn-based entrepreneur said the rejections and taunts simply fire her up. Abovitz was one of more than a dozen speakers who reflected on their creative processes on October 5 at the first-ever Generators Summit sponsored by issuu, the digital publishing platform. Though issuu works primarily with print and online publishers and brands to distribute digital content, the summit featured speakers and participants from across the creative spectrum – virtual reality and video games, design and visual art, technology and video, as well as publishing. About 150 entrepreneurs and artists of all stripes gathered for the summit at the Pearl, a multi-level event space in the hip Dogpatch neighborhood in San Francisco’s South of Market district. It began with bite-size quiches, yogurt and fruit salad on the roof followed by a guided meditation led by Will Kabat-Zinn, an insight meditation teacher who studied mindfulness at monasteries in Burma. 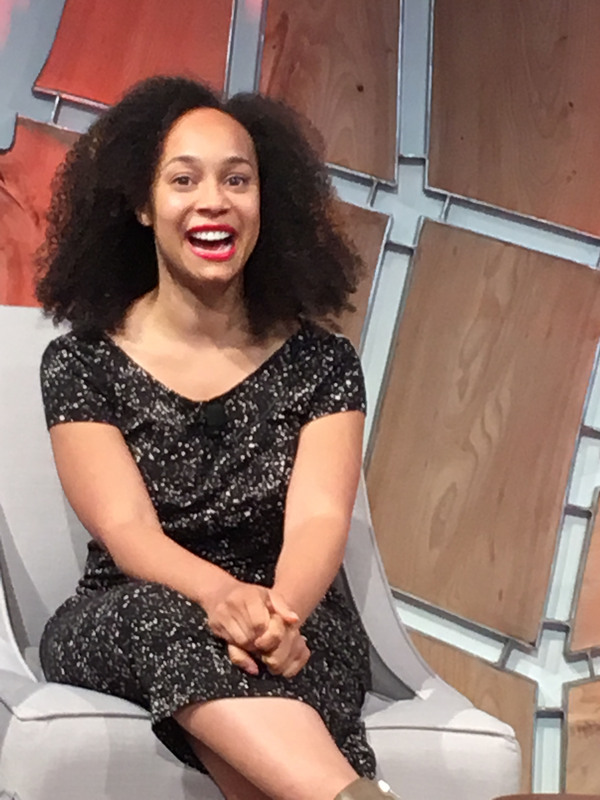 Abovitz spoke on a panel featuring new voices in media that included Morgan DeBaun, founder and CEO of Blavity, a tech media platform for black millennials, and Lauren Redding, publisher of Rookie, a media company and book series for teen girls. All three women talked about the challenges of starting and growing a media business when you’re female and young. Rookie was founded in 2011 by Tavi Gevinson, then a 15-year-old high school student who had already won attention for the fashion blog Style Rookie, which she started publishing at the age of 12. Morgan DeBaun, founder and CEO of Blavity, brought the multi-platform media company to life just as the Black Lives Matter Movement was gathering steam. It’s now one of the fastest growing media companies. DeBaun started working on Blavity around the time Michael Brown was killed by a Ferguson, Missouri police officer. As she watched communities around the country rise up in protest, she felt that “traditional black media – Essence and Ebony – weren’t covering what was really going on,” she said. DeBaun, who was then working for a Silicon Valley startup that had been purchased by Intuit, wanted Blavity (a mashup of “black” and “gravity”), to fill the gap, giving people a centralized place where they could share their thoughts and experiences. In just three years, the site has grown into a multi-platform digital media outlet that produces and distributes news, video and opinion pieces, reaching 7 million millennials a month. The company also sponsors events like AfroTech, an annual conference in Silicon Valley for black professionals that is co-sponsored by top tech companies like Google, Facebook, Uber and Airbandb. Last month, Blavity acquired travel startup Travel Noire. While the theme of the day was creativity, speakers weren’t afraid to discuss practical matters, including the novel ways they had found to make money as artists, writers and thinkers. DeBaun said Blavity makes money “every way a media company can,” through conferences, sponsorships, subscriptions, advertising, paid premium content, sponsored content, video and old-fashioned display advertising. All three said the key to their success are audiences that appreciate their content. “We have a deeply invested, engaged audience that shows up online, that shows up on social media, that shows up to buy our books and shows up to listen to our podcast,” Redding said. Later in the day, during a session on venture capital, a panel of experts supported the notion that engaged audiences are willing to pay for content. Issuu is also investing in the idea that consumers will pay for content. Paul Vitale of Sweet Paul Magazine said issuu’s new digital sales initiative makes it easier to sell the magazine to consumers. As part of the conference, Hyrkin unveiled issuu’s new digital sales initiative, which allows publishers to sell digital content through issuu using Stripe, an online payment system. Until now, content on issuu has been free and publishers who wanted to charge had to find their own payment systems. Using this new option, publishers can now sell specific content, such as individual publications, or subscriptions to their content, and they can accept payments on their websites, on social media and on issuu itself. The digital sales program offers both publishers and issuu a new source of revenue. Issuu takes a 30 percent cut for each transaction and Stripe will get 2 to 3 percent. That leaves about 67 or 68 percent for the publishers, who set their own prices. 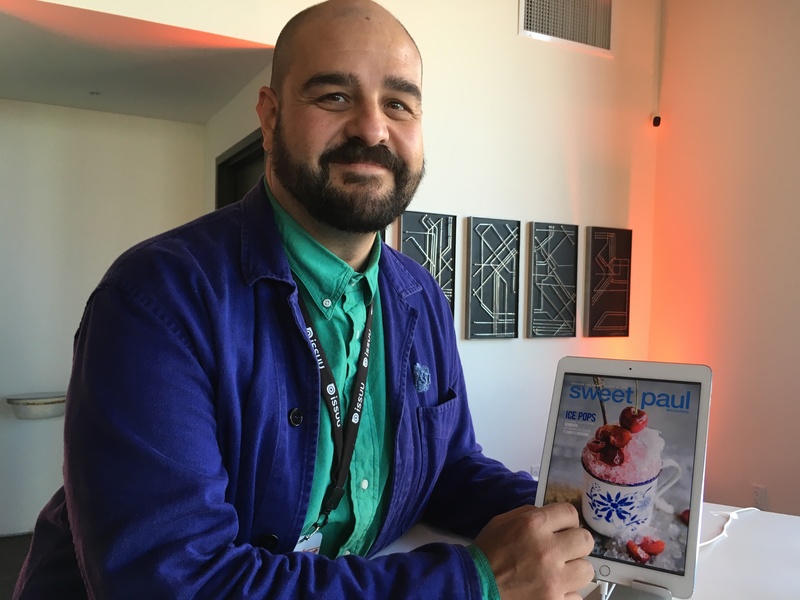 Paul Vitale, marketing and business development director for Sweet Paul Magazine, a food and lifestyle magazine, beta-tested the new digital sales system earlier this year and found it to be a simple and easy way for the magazine to sell content and for consumers to buy it. Rachele Kanigel is an associate professor of journalism at San Francisco State University, where she advises Golden Gate Xpress, the student newspaper, and teaches reporting, writing, magazine and online journalism classes. She was a daily newspaper reporter for 15 years and has freelanced for magazines and websites. She has taught in or directed five summer study-abroad programs for the Institute for Education in International Media (ieiMedia). She is the author of The Student Newspaper Survival Guide. Follow her at @jourprof.